Frank Wetta sets the stage for three essays by Ken Noe, Carol Reardon, and George Rable on how each of these authors approaches writing military history. He covers some of the tension and misunderstandings between those writing “old” military history, the “guns and bugles” approach, and those writing “new” military history, more of a social history approach. According to Wetta, each side has learned the other side has something to offer in the study of military history. Ken Noe discusses his initial belief that writing battle history would be easy. He learned quite quickly during the creation of Perryville: This Grand Havoc of Battle this was not the case. Rather than pieces of a jigsaw puzzle which fit neatly together, Noe found multiple conflicting accounts, with no two people remembering an event the same way. Writing battle history well requires sifting through these diverse and disparate bits of information to find a tenuous whole, something Noe admits is a “house of cards” which might come tumbling down with a new bit of evidence which turns up after a book is written. He has received favorable responses from numerous directions (including mine) for his inclusion of a “new social history” chapter at the end of the book which discussed how soldiers fared after the battle and the war, what happened to the town of Perryville when it was forced to deal with thousands of dead, dying, and otherwise wounded men, and what the battle meant in the larger context of the war. He expresses concern over the lack of military historians writing about military history, partly due to academia’s disdain for military history, and partly because social historians have begun to try to write military history without much (or any) training. 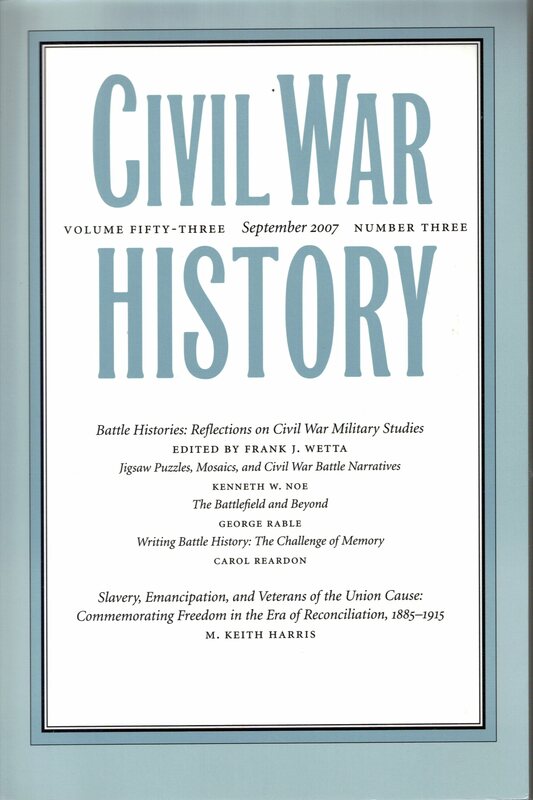 Noe also agrees with Mark Grimsely’s assertion that there are not enough people, academic or otherwise, writing about the Civil War who also have knowledge of worldwide military history. In the end, he says, writing battle history is more like creating a mosaic of events rather than a jigsaw puzzle. Rable starts his essay by discussing commonly held and diametrically opposed views of military history by academics and “buffs”. He encourages both sides to reconsider their views and to see that traditional military history is worthwhile, and can be made even more worthwhile with the addition of social history elements to the mix. His main point is that the effects of a major battle can be felt far beyond the battlefield itself, and he offers several new ways to study battles which we would all benefit from. He first mentions “war news”, the ways in whic a major battle was reported to the masses, via newspapers, soldiers’ letters, and other sources. His second topic is logistics, and suggests it would be worth studying how well each army was equipped on the eve of a major battle and whether or not that had an effect on the results of said battle. Lastly, he cites religion as a neglected topic when applied to the battlefield. For instance, why were certain men kiled or maimed while others were spared? In addition, how did each side use religion to explain victories and defeats. In his conclusion, Rable impresses upon the reader that his desire is not to replace traditional battle history, but to enhance it by looking at battles and battlefields from new directions. Carol Reardon discusses the relatively new study of memory and cautions military historians to redouble their efforts when sifting through the always contradictory reports of any battle or engagement. She encourages the twin ideas of Position and Perspective, or where was the soldier on the battlefield and what could he see. She goes into a discussion of how and why veterans of the conflict might consciously or subconsciously write an account of a battle which clearly deviated from fact. Reaerdon stresses to historians the need to be aware of memory masquerading as history when trying to write battle history. Keith Harris challenges recent assertions that Northern veterans were willing to ignore slavery in attempt to reconcile with the Southern states after the war ended. Citing numerous speeches, letters, and published works, Harris shows that not all Northerners were willing to sit idly by and watch the South “win” the war with their pens. Banners South: A Northern Community at War by Edmund J. Raus Jr.